Steer toward the most advanced minivans from Honda and Chrysler, but if you must buy something cheaply, choose a 2008 Chevrolet Uplander with side airbags. Be prepared to run it as long as possible, since resale value will be minimal. TheCarConnection.com's editors read the latest reviews on the new 2008 Chevrolet Uplander to write this comprehensive review. Our car experts also drove the 2008 Chevrolet Uplander to be able to deliver our definitive opinion on the car, to compare it with other cars in the class, and to help steer you toward the perfect car. The 2008 Chevrolet Uplander is the last of the old-style minivans still standing. While the world has adopted seats that fold into the floor, like those in the Honda Odyssey and Dodge Grand Caravan, the Chevrolet Uplander heads into its last year on the market with removable seats, a dated powertrain and style, and an uncompetitive package of safety gear. The Uplander owes its SUV-like appearance to a slightly higher ride height and unique styling cues, though it retains sliding rear-side doors and offers three rows of seating for as many as seven passengers. Compared to the well-detailed Honda Odyssey, it's forgettable and outdated. The 2008 Chevrolet Uplander comes with a 3.9-liter, 240-horsepower V-6 that also offers E85/flex-fuel capability. It's teamed with a standard four-speed automatic transmission and front-wheel drive. Performance and fuel economy, at 16/23 mpg, is uninspiring, and there's no all-wheel-drive option. The Uplander features include a 50/50-split rear seat that folds into the floor; the second-row seats are also foldable and removable as needed to maximize cargo-carrying abilities, but they don't stow in the floor like the state-of-the-art seats in Chrysler's minivans. There's also a load-leveling suspension available. Anti-lock brakes are standard, but curtain and side airbags are options, a near-fatal omission in this segment. With the optional side airbags, the Chevy Uplander receives mostly five-star ratings from the feds for front- and side-impact crash tests. The IIHS rates it as "good" in a frontal crash; in a side impact, it says the Uplander is "acceptable" when fitted with side airbags and "marginal" without them. An optional roof-mounted DVD entertainment system incorporates a 20GB hard drive for media storage. Tire pressure monitors and OnStar are standard for 2008, as is XM Satellite Radio. Even when disguised as an SUV, the 2008 Chevrolet Uplander shows its old-school minivan roots. The 2008 Chevrolet Uplander owes its SUV-like appearance to a slightly higher ride height and unique styling cues, though it retains sliding rear-side doors and offers three rows of seating for as many as seven passengers. Compared to the well-detailed Honda Odyssey, it's forgettable and outdated. Cars.com feels the same way about the Uplander's styling. 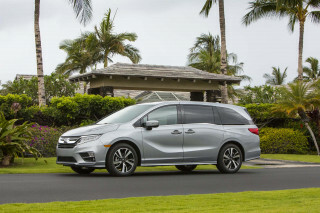 "Though it has sport utility vehicle styling cues, its seven-passenger seating capacity, low step-in height and sliding side doors mean it isn't far removed from the minivans that GM has offered for years." 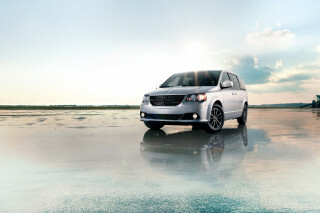 Of course, "the company hopes to avoid the minivan's tame image, though." The 2008 Uplander can be ordered in both regular and long extended-wheelbase versions, as well as a flower store delivery-capable cargo van. Nearly all the consumer car Web sites reviewed by TheCarConnection.com agree that the Uplander's interior is among its best attributes. 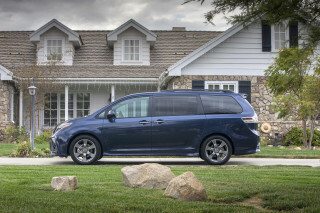 Kelley Blue Book notes "the interior is one of the nicest you'll find in any minivan." ConsumerGuide agrees and adds, "Switchgear and cabin materials show upscale flair"--though they're not too keen about the dashboard trays and drawers because of the "budget-grade plastic" they're molded from. The 2008 Chevrolet Uplander has improved power and handling, but it’s still a minivan—an aged one, at that. The 2008 Chevrolet Uplander comes with a 3.9-liter, 240-horsepower V-6 that also offers E85/flex-fuel capability. It's teamed with a standard four-speed automatic transmission and front-wheel drive. Performance and fuel economy, at 16/23 mpg, are uninspiring, and there's no all-wheel-drive option. Kelley Blue Book notes "the Uplander's 3.9-liter V6 is a vast improvement over the previous 3.5-liter engine." They go on to say that it offers improved low-end torque and passing power, "as well as smooth vibration-free operation." The front-wheel drive is apparently a good match for this type of vehicle because it provides "good traction in rain and snow." The larger engine also increases the Uplander's towing rating to 3,500 pounds, which is decent for a minivan. Edmunds reports, “The V6 provides adequate power and the engine is reasonably smooth, although its powertrain lacks the finesse of rivals from Honda, Dodge and even Kia.” Car and Driver says, “Even the four-speed automatic transmission seems antiquated.” The Uplander is available with a FlexFuel version of the same 3.9-liter engine that can run on standard gasoline or an E85 blend of ethanol and gasoline. The 2008 Chevrolet Uplander offers plenty of comfort, but it’s not as roomy or as flexible as the latest Chrysler or Honda minivans. Just about all the auto reviewers agree that the 2008 Chevrolet Uplander has a much nicer interior than its predecessor, the Venture. However, the Uplander’s interior doesn’t live up to the flexibility standards set by Chrysler and Honda. The Uplander features include a 50/50-split rear seat that folds into the floor; the second-row seats are also foldable and removable as needed to maximize cargo-carrying abilities, but they don't stow in the floor like the state-of-the-art seats in Chrysler's minivans. “Base LS Uplanders have removable modular seats in the second row, although removing and installing them isn't exactly easy,” Edmunds reports. “The LT has fixed captain's chairs.” On top of that, Kelley Blue Book claims that the 2008 Uplander's narrow design makes it tight in the areas of hip and shoulder room for most passengers. However, ConsumerGuide agrees that the Uplander's cabin has generous head- and legroom in the first two rows, but says the third-row seats are too close to the floor for ideal adult comfort. 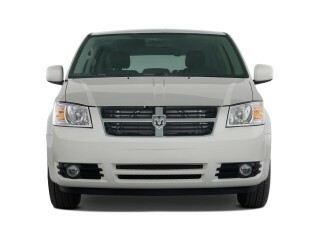 The "low step-in makes getting in or out a simple matter," which is one of the advantages of owning a minivan. 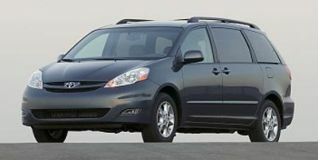 ConsumerGuide also notes that while an available cargo organizer helps keep stuff from rolling about the cabin, "GM's minivans have less storage space behind the third row seat than rivals with a hideaway-seat floor well." Cars.com points out the 2008 Uplander's flexible rear cargo system has three dividers. "Total cargo volume on extended-length models is 136.5 cubic feet with the second- and third-row seats folded and 26.9 cubic feet with all the seats up. Regular models have 120.1 cubic feet of total cargo volume; it's 17.7 with the seats up." Interior quality in the Uplander is improved from the days of the Venture. Edmunds claims that the interior two-tone color scheme and materials have a "pleasing overall look." Kelley Blue Book states, "GM says it is dedicated to improving the interior quality of its cars, and the Chevrolet Uplander proves it." The French-stitched seams on the door panels and seats look classy, and the dash instrumentation "gorgeous." There's also a healthy dose of sound-deadening insulation to "make life with the Uplander a thoroughly pleasant experience." The 2008 Chevrolet Uplander doesn’t meet the high safety standards set by other minivans, but it scores well in crash tests. The 2008 Chevrolet Uplander scores well in crash tests when outfitted with side airbags, but those features are optional, which lowers the Uplander’s crash score from TheCarConnection.com. The National Highway Traffic Safety Administration (NHTSA) gives the Uplander five stars for most front and side impacts, save for a four-star rating for front-seat side impacts. 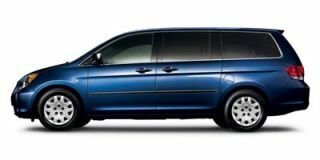 For rollovers, the minivan scores only three stars. The Insurance Institute for Highway Safety (IIHS) rates it "good" in a frontal crash; in a side impact, it says the Uplander is "acceptable" when fitted with side airbags and "marginal" without them. Edmunds notes that the "Chevrolet Uplander does an OK job of protecting its valuable human cargo but falls short of other minivans." 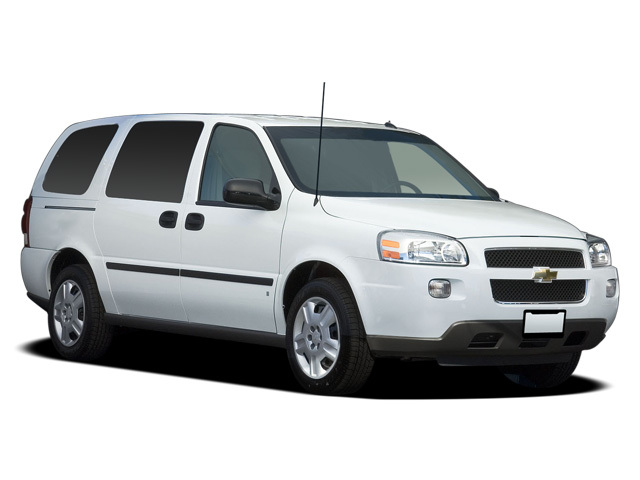 The 2008 Chevrolet Uplander includes the following safety features: driver and passenger front side airbags, all-disc anti-lock brakes, daytime running lamps, electronic stability control, and child safety locks. Optional side impact airbags are available for the first and second row. "Although these airbags essentially do the same job as the side curtain airbags offered on all other minivans,” Edmunds adds, “there is no side protection available for the third row." The 2008 Chevrolet Uplander has a reasonably nice list of standard and optional equipment, but nothing that makes it stand out from the crowd. Most reviews read by TheCarConnection.com are impressed with the 2008 Chevy Uplander's extensive list of standard and optional features. According to Edmunds, "the Uplander is available in regular and long wheelbase models as well as a cargo van." Both versions are front-wheel drive, equipped with a 3.9-liter, 240-hp V-6 engines and four-speed automatic transmissions. "It comes in LS and LT trim levels, both of which seat seven with a fold-flat 50/50-split third row seat." According to ConsumerGuide, the following features are standard on the 2008 Chevrolet Uplander: seven-passenger seating, third-row split folding seat, front air conditioning, tilt steering wheel, cloth upholstery, quad bucket seats, power mirrors, power front windows, power door locks, remote keyless entry, AM/FM/CD/MP3 player, digital-media player connection, tachometer, intermittent wipers, and automatic headlights. "OnStar assistance system w/one year service and XM satellite radio are also standard," they write. Edmunds says in creature comforts, "the Uplander does have a few aces up its sleeve." The LT version's overhead rail system provides easy access to the air conditioning controls and entertainment system from the rear seats. They also like the PhatNoise digital media system and the fact that it has a hard drive to store music so that you don't have to carry around a bunch of CDs. Cars.Com notes that the Uplander's DVD entertainment system with flip-down screen for the rear passengers has a larger eight-inch screen, and that "the rear entertainment package is standard on the LT models and optional on the LS models." Kelley Blue Book picks the "Remote Start that lets you start the engine from as far away as 500 feet" as one of their favorite features. They also like the power sliding door, flip-down DVD player with rear audio controls (standard on the LT), and second-row captain's chair seating (also standard on the LT). However, the Chevrolet Uplander lacks many features that are offered on the likes of the Chrysler Town & Country—among them, navigation systems and Bluetooth cell phone connectivity, not to mention stowable seats and storage bins under second-row seats. In the end, it comes down to usability; the Uplander’s nonremovable seats and its nonstandard PhatNoise system just aren’t as functional or as appealing as Chrysler’s Stow ‘n Go seating or its entertainment system’s ability to control an iPod.